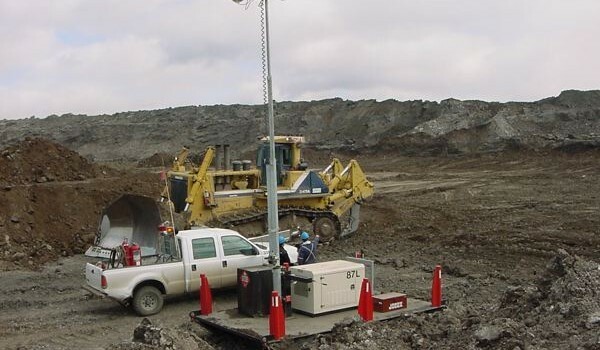 We offer a wide range of telescoping light masts that can be added to your existing structures and equipment or as free standing units on base skids. With the same durability and simplicity of all Power Tower equipment these masts are an economical means of lighting the areas around equipment and facilities using existing power sources, shore power or complete with its own power supply. When the equipment arrives at site the light supply is there with it. For additional value and performance from your present equipment, our large range of utility mast assemblies can be equipped to provide lighting systems, video surveillance, public address systems or communications. Virtually any piece of equipment can be enhanced with the addition of one of our lighting systems. By adding a light system to your vehicle, portable building, portable genset, heater trailer, lunch trailer, or job trailer you can benefit from the convenience of having job site lighting with the unit at all times resulting in higher productivity and safer working conditions. With our vast experience with various types of masts and lighting arrangements, we can offer the right products or custom built units to suit your application large or small. Systems can be powered by available generator output or by shore power as available. CSA approved assemblies are complete with switch panels, ballast racks and lamp stowage systems for transport. Masts can be equipped with your choice of a full range of metal halide, low pressure sodium or LED lamps to suit your particular application and budget. Telescoping masts can be operated by hand winches, electric winches or hydraulic cylinders. We can also custom build mast assemblies and lighting packages to suit any of your special requirements including installing on existing equipment or as free standing transportable units. We can also engineer assemblies for wind load certification. Here are a few examples of some of our utility light units. Light mast at de-ice pad at airport. Two-light jobsite mast on a portable equipment trailer. VM25 on a camp support unit. Six-lamp VM25 utility mast on a portable building. Our standard vertical mast, the VM25, raises four 1000 watt metal halide lamps to a full 25 foot height to provide light for work and safety around your equipment. With a rotating light bar and fully adjustable lamps the package is complete with everything you will need to install it on your equipment except the 30 amp/240 V receptacle to plug to it in. The mast will support up to eight 1000 W metal halide lamps or equivalent. The VM25-E4MH electrical assembly can be added as a unit or as individual components mounted directly to the mast. Standard VM25 Utility Light Mast. The PT2-15 hydraulic vertical mast offers a compact assembly with the convenience of push button raise and lower controls. The low profile allows for safe lamp installation at ground level with an extended height of almost 28 feet from the base. The unit is shipped complete with a high quality 12V electro/hydraulic unit. The PT1-PT2 Laydown Mast is a freestanding economical system for adding a mast to low profile equipment, gensets, work trailers, etc. At nearly a 30 foot extended height the value of a full light tower can be added to existing equipment at minimal cost. The custom built pedestal base allows the mast to fit unusual shaped equipment with the convenience of installing and servicing lamps from the ground. Our vertical mast offers the maximum light dispersion with one of the tallest masts in the industry.